My Name is Michelle Ardillo and I am a . . .
It’s Saturday morning. Early spring. Birds are singing, bees are buzzing, the sun is shining. Right now, I should be doing laundry or changing the sheets on the beds or at least unloading the dishwasher. I could be grading papers or doing lesson plans, mapping out the remaining six weeks of school (but who’s counting, LOL). But, instead, I am alone, in my pajamas, in a darkened room, crouched in an uncomfortable position, wasting away hour after hour of my morning. Alcohol? Drugs? Online gambling? Online shopping? No, these are not my addictions. Instead of taking care of household chores, instead of running errands, instead of taking my dog for a brisk walk in the beautiful sunshine, no, instead of these worthy things, I am tapping and swiping away on my tablet, happily connected to the world-wide web of epicure, dazedly surfing the culinary net, reading food blogs, and trapped in a vicious never-ending battle to read every last recipe on earth and what’s worse, to “pin” them to boards I will rarely ever visit. I am hooked on the world of food. Hello, my name is Michelle Ardillo and I am a foodaholic. You see, I love everything there is about food. I love to cook and I love to eat. I read cookbooks like novels, cover to cover, pouring over the photographs and editor’s notes about how to serve this or that dish or what advance prep can be done. To say that I have an extensive collection of cookbooks would be somewhat of an understatement. 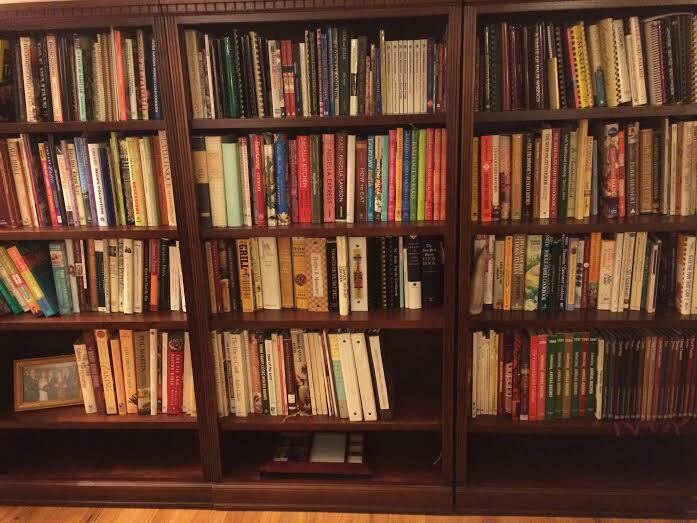 When we did a major book reorganization a few years ago, including building an entire wall of bookshelves in our home office, I moved all of my cookbooks to the wall of bookshelves in our living room, which is closer to the kitchen. My collection of scripts and librettos were moved downstairs, along with my collection of books on the royal families of some of the world’s monarchies. It might be weird to some people to have a wall of cookbooks in their living room, but it seems perfectly natural to me. If I eat something I really like in a good restaurant, you can bet that I will be trying to recreate that dish at home. For years I tried to replicate the veggie chili from Silver Diner, to no avail. I made some really good batches of veggie chili, but not a single one was exactly like Silver Diner’s. I have been successful though. I am very, very close to the taste and consistency of the hummus at Lebanese Taverna. I once attended a theatre group committee meeting where someone had brought a fruit platter from a grocery store and in the center of the platter was a tub of “dip”. It was delicious. All of the different fruits tasted great dipped in that white creamy concoction. It took several tries but I was able to recreate that one: cream cheese, powdered sugar, milk, and almond extract. So, and I say this as modestly as I can, you can imagine how successful I am when I have an actual recipe in front of me. In our cable package we have two food channels, Food Network and The Cooking Channel. Of course, there’s also PBS and the many great chefs we’ve been introduced to over the years: Julia Child (rest in peace), Jacques Pepin, Pierre Franey (also rest in peace), Lidia Bastianich, Sara Moulton, and many others. I’ve watched entire series of cooking shows on PBS and then I just have to have the companion cookbook so I can make the dishes from the shows. As documented in a previous essay, my autographed Jacques Pepin cookbook is creased and greased from frequent use. I’ve learned a great deal from watching all of those shows. Once I watched a show where the chef “spatchcocked” a whole chicken. I was fascinated at this technique of butterflying a chicken, opening it like a book, removing a few bones and making a few slashes here and there, and thereby reducing the roasting time significantly. I don’t remember which television chef first taught me this technique but I have watched the process many times since, expertly done by Martha Stewart and British chefs Jamie Oliver and Nigella Lawson. I recently cooked this for my dad and brother while visiting them in Louisiana. This method ensures that the white and dark meat cook evenly and it also makes carving a whole chicken a snap. I love to try new foods and go on culinary adventures to try out cuisines from other countries. I am very lucky to live in the Washington, DC metropolitan area where I can dine on food from many different cultures: Lebanese, Greek, Japanese, Indian, Spanish, Thai, Salvadoran, Moroccan, Peruvian, Belgian, and of course, the more prosaic cuisines of China, France, Italy, and Mexico. For two years I lived in Belgium and a major adjustment was the loss of American television. I had to say goodbye to my cooking shows and not seeing my favorite chefs was akin to withdrawal. Without a satellite dish we had access to only two English-speaking channels (BBC1 and BBC2) other than CNN International. Each afternoon a very popular cooking show, Ready Steady Cook, would come on (except when it was preempted during snooker tournaments, major horse riding or horse racing events, soccer, cricket and of course, rugby championships, it is a British television network after all). It was somewhat like Chopped, the popular cooking competition show on the Food Network. An audience member was called to the stage and would dump out a brown paper grocery bag with “mystery ingredients”. The guest chef would have to prepare a starter, entrée, and dessert from the contents of the grocery bag, and the staples in the on-stage pantry. While more game show than cooking show, I did learn a lot from it. One chef, James Martin, always made a soup from whatever was in the grocery bag, and to this day I still follow his method for starting a soup: sauté a sliced onion in a little olive oil and a bit of butter. When soft, add other aromatics such as garlic, fresh herbs, celery, or shallots. Add the main ingredient (peas, squash, potatoes, carrots, etc.) and cover with chicken stock or vegetable stock. Bring to a boil and then simmer until the main ingredient is cooked through. Puree with a stick blender or in a food processor or serve as is. Viola! 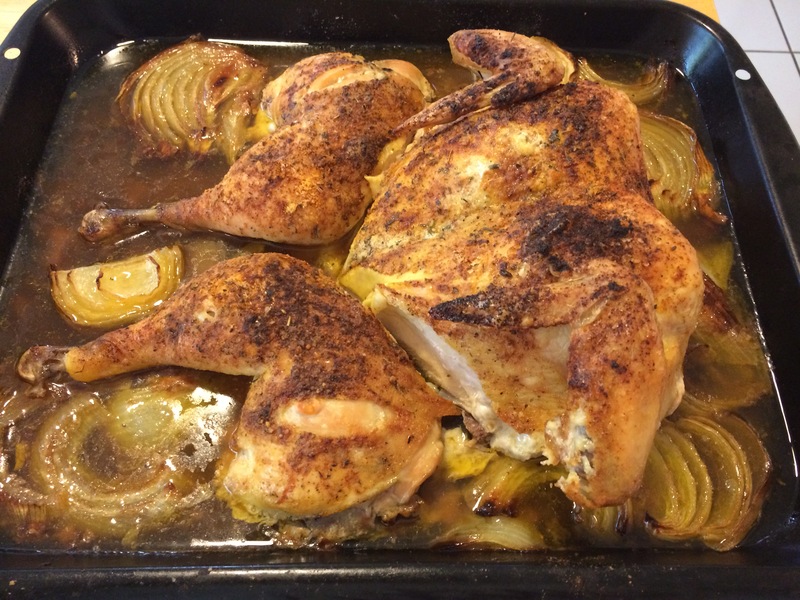 This simple recipe can be adapted to almost anyone’s taste or dietary requirements. Often during prime time, there would be a “cookery show” as the British say, most often Delia Smith, the doyenne of British cooking, the Martha Stewart (without the stock problem….and I mean NYSE stock, not the chicken or beef kind) of the UK, or Rick Stein, a British chap who can film an entire show on one kind of fish. Having only the BBC to turn to for TV cooking during those two years meant that I acquired new best friends in the world of cooking. Gone were my lazy Sunday afternoons watching a Julia Child marathon on PBS (freshly ground WHITE pepper, not black), or the slightly flirtatious Jacques Pepin, or the loud-mouthed Emeril Lagasse cooking his “adopted” Louisiana foods (not a Cajun, he grew up in New England, for goodness sake! ), or the simple earthy home style cooking of Lidia Bastianich. Instead, I got to know Ainsley Harriott, whose 6 foot plus frame could barely contain his Caribbean excitement for life, James Martin spinning sugar for his dessert creations, Nick Nairns showing off Scottish game and seafood to its finest, and the spiked hair of Gary Rhodes making a Sunday roast look like the most exciting dinner one could possibly imagine. Of course, it is better to be addicted to the world of food than alcohol, drugs, designer handbags, or shoes. To my friends, I am somewhat of a 24/7 food consultant. It is nothing for me to answer the phone to hear “What is a Dutch oven?” “I’m out of self-rising flour, what do I do?” “I need an appetizer to bring to a party.” Other than fighting a losing battle with the scale and my cholesterol, there are other real benefits to specializing in one particular area of study. Without a doubt in the world, I know I could win The Weakest Link, Who Wants to be a Millionaire, or even Jeopardy, for goodness sake, if (and this is a big IF) all the questions were food related. michelle, you are making me hungry! lovely glimpse into your world. thank you.